Ultima I: The First Age of Darkness is the first official game in the series (as Akalabeth doesn't really count). It was published for the Apple II by California Pacific Computer Co. on September 2nd, 1980, simply under the name "Ultima" (before it was known that there would be more than one installment). At a time where the age of computer games was just beginning, it was something very new and for its time showed much detail. Unlike Akalabeth, Ultima I was from the start a commercial product. Ultima inspired many other RPGs of the early to mid-eighties, laying the foundation for a whole genre. While complex for its time, it lacked practically all features of later installments, making it a simple hack-n-slash game. The game was re-released on December 23rd, 1986 by Origin on a number of other platforms, including IBM-PC and C64. The game now had extras the original was missing. Details were changed and the whole game got a face-lift to make it more appealing to the players of the mid-eighties. 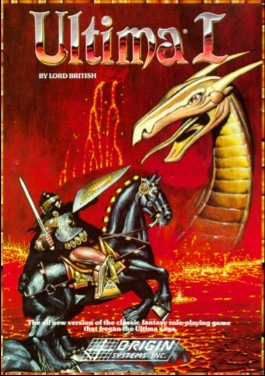 The original was quite a success in its time, when computer games were something completely new, and started the Ultima series. The re-release of 1986 of course sold better, with the series already established and well-known. ▪ Paper maps of the four continents of Sosaria. The wizard Mondain, after his first defeat in Akalabeth, attacks Sosaria again with his hordes of evil and foul magic, threatening to crush the world beneath his heel. The Player, in the role of the Stranger, travels to Sosaria for the very first time, to stop Mondain's plans from succeeding. However, Mondain has become immortal thanks to a magic gem, and his fortress is unreachable, making the mission difficult. The Stranger must fulfill several quests for the various kings of the land, in order to obtain four different colored gems, before venturing into outer space to battle malicious "starwalking" creatures. After this is done, a freed princess reveals the location of a hidden time machine, with which Mondain's fortress can be breached. Confronting Mondain, the Stranger shatters the Gem of Immortality so that Mondain can be defeated, and Sosaria free of his evil. Thus, Sosaria is finally safe from the evil wizard. ▪ The original Ultima sold 50,000 copies. For a time where computers where only seen as tools for the workplace, this is an amazing feat. 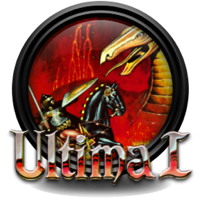 ▪ Early on, the title "Ultimatum" was chosen, but the name was trademarked by a board game already, so the publisher suggested truncating it to "Ultima." ▪ While the cover of the re-release is the same as the original, the name was changed to "Ultima I", to reflect that it is the beginning of the series. ▪ The first commercial game to use tile graphics to display the surroundings. ▪ The original was an actual two-man production only: Richard Garriott and Ken W. Arnold.